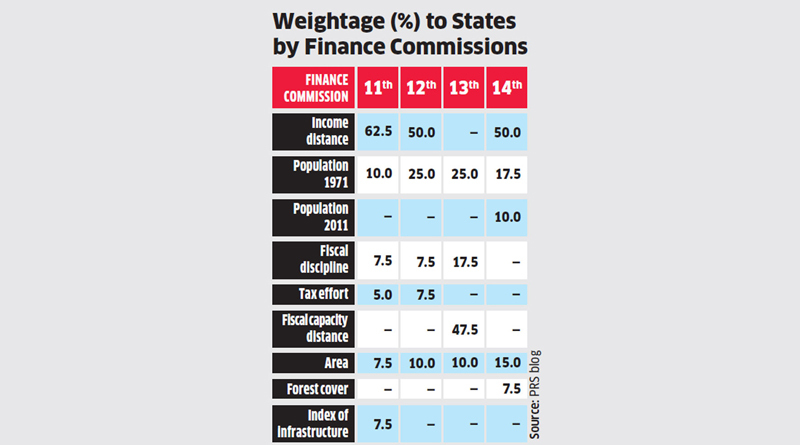 The terms of reference of the 15th Finance Commission have raised a storm of protest, because they mandate the use of 2011 census data, not the 1971 data used by earlier Finance Commissions, to help determine the sharing of central taxes between the states. The southern states have been especially vocal, although this affects the western states too. This ruckus has distracted attention from the broader question of which flaws in the existing system should become the focus of conditionalities and weightage attached to state performance. The terms of reference of the commission include making proposals to reward good performance and penalise slacking. Of the many institutional reforms that have been sabotaged in the past, none stands out so starkly as the sabotage of the 74th constitutional amendment providing for the empowerment of urban local bodies — nagarpalikas, or municipalities. The 73rd and 74th amendments were supposed to ensure that panchayats and nagarpalikas respectively got political and economic empowerment of a substantial nature, ensuring that all power in a state was not concentrated in the state capital. Unfortunately, these amendments allowed each state to decide what powers should be decentralised, the result being that devolution was grossly insufficient. State capitals did not want to cede significant power or cash to local bodies. Nevertheless, some functions were indeed devolved, but more for panchayats than nagarpalikas, notably in a few states like Kerala. Separately, central schemes like MNREGA provided for panchayats to choose and implement at least half the rural works under the scheme. Successive Finance Commissions (appointed every five years) began making provisions for the sharing of central revenue with not just state governments but also local bodies. The 15th Finance Commission should go further down this road. However, merely handing out additional cash will not end the sabotage of urban decentralisation by state capitals. With only a few exceptions, Indian cities are basically run by chief ministers through bureaucrats, not by empowered mayors, as happens in many countries. The mayor of New York City, for instance, is so powerful that he is often viewed as a potential candidate to run for president. In Indonesia, Joko Widodo made his reputation as mayor of the city of Solo, and later ran the city of Jakarta so well that he ran for and became president. For that very reason, Indian CMs do not want cities to have powerful mayors, since they may become political rivals. Besides, cities are rich and provide huge scope for patronage and kickbacks, which no CM wants to share with an empowered mayor. Most municipalities are superseded by the state government, or given few powers. Delhi is an exception, since it is a city-state ruled by a chief minister. Yet, many areas and administrative functions are managed directly by the central government, or by three municipal corporations. This division of power dilutes whatever decentralisation actually takes place. Chief minister Arvind Kejriwal complains bitterly of being sabotaged by GoI at every step. No PM would like the Delhi CM to become politically strong and popular — and, hence, a political rival — even if the two belong to the same party. In sum, the 74th amendment to the Constitution has proved in practice to be a farce. Global experience shows that effective decentralisation has three dimensions: political, administrative and financial. Political decentralisation requires local body elections, which are indeed held in India. Administrative decentralisation requires the devolution of administrative functions, plus hiring and firing to local bodies, and no state government wants to go far in this. Financial decentralisation requires devolution of tax powers plus higher automatic cash devolutions from central and state revenues to local bodies. And no state capital is keen on this either. If any one of the three dimensions are missing, decentralisation typically fails. If, for instance, a local body has elections but lacks devolved administrative powers or devolved funding, it becomes a cosmetic, powerless husk. This, alas, has been the fate of nagarpalikas. The 15th Finance Commission should not rest content with merely devolving some modest funds to panchayats and nagarpalikas. More important will be the introduction of conditionalities: some proportion of central revenues should be given only to states that clear certain benchmarks with regard to urban decentralisation. Over and above that, a significant weightage — at least 5-10% — in the sharing of revenues between states should be assigned to the achievement of these benchmarks. Right now, there is no institutional check on the sabotage of the 74th amendment by state governments. Neither the courts nor GoI can force the states to empower city governments. But the Finance Commission can certainly propose substantial rewards for states that are serious about decentralisation, and penalties for those that are not. Such an incentive system may not be strong enough to produce radical results. There is no chance, for instance, that any state government will devolve police powers on major cities, as happens in the US. But even modest urban empowerment will be better than today’s farce.